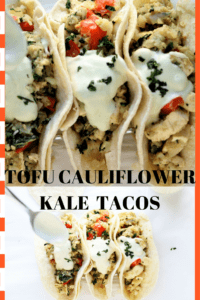 Tofu Cauliflower Kale Tacos With Lemon Mint Creme is a great gluten free, vegan meal. It is Taco Tuesday, and as far as I am concerned, everyday can be Taco Tuesday. Corn tortillas are the one thing that those on a gluten free diet can eat without feeling like they have resorted to an inadequate substitute for the gluten version. Genuine tacos are made with corn tortillas, so there is no deprivation or sacrifice involved. 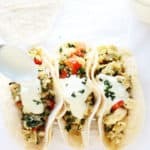 This vegan version of Tofu Cauliflower Kale Tacos with marinated tofu, cauliflower, kale and peppers is light and healthy and the tangy lemon mint crème, makes them feel like a treat. If you enjoy a lower carbohydrate meal, you can serve the stirfy topped with the lemon mint crème, without the tortillas. Vegan, gluten free, dairy free. 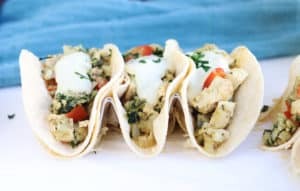 Tofu Cauliflower Tacos With Lemon Mint Creme. Vegan, gluten free, dairy free. Mix all marinade ingredients and marinate tofu for 30 minutes. Cook cauliflower and kale in microwave for 2 minutes. Drain water, if any. Saute onions, garlic, red pepper and tofu in olive oil. Drain excess water from pan before adding spices so that your tacos are not soggy. Add salt, cinnamon, coconut aminos and curry paste. Add cooked cauliflower and kale. Mix vegetables into tofu stirfry. Saute 3-5 minutes until kale and cauliflower are thoroughly mixed and cooked. 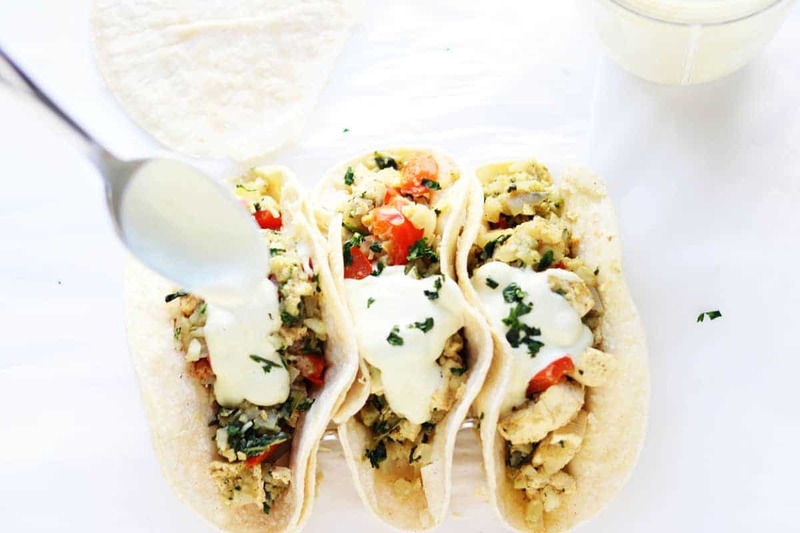 Spoon stirfry mix into heated corn tortillas and top with lemon mint crème.